I've been really happy with the flavor of the Stirred-Curd cheddars so far... but the texture hasn't been quite right. It's been a bit crumbly and dry. Doing a little more research, it seems that the solution might be to use a little more rennet. (The vegetarian rennet I have says on the bottle it's "double-strength," so I had been using half what the recipe calls for...). 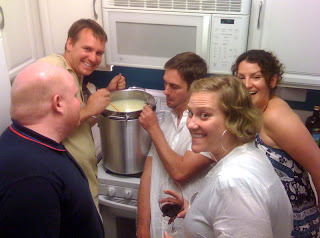 On Sunday I had some friends over and we made a batch of Stirred-Curd Cheddar, but used 3/4 tsp. of rennet instead of the previous 1/2 tsp. What a difference! The curds set significantly faster (about 45 minutes), and were ready for cutting after only 45 minutes. After that, everything seemed about the same--until taking the cheese out of the press. The curds knit together much more smoothly, as the outside of the cheese was much smoother and, well, "cheddar-like"... and the feel of the entire wheel of cheese is a little more rubbery* and feels like it has a bit more moisture to it. 2 gal. Trader Joe's Organic Whole Milk. * in a good way.